Mountain Mavericks is so much more than a travel specialist. We’re extremely passionate about the sports our beautiful surroundings inspire, and want to support our staff to get out there and ride as much as possible! Whether its skis, snowboards or bikes, we encourage everyone to make the most of our amazing alpine environment and love what they do. Following this ethos, we’re delighted to be able to support and sponsor Sissy Herant, our Hotel L’Aubergade bar tender. Sissy is a UK Freeskier that learnt to ski at Stoke Ski Centre aged 11. 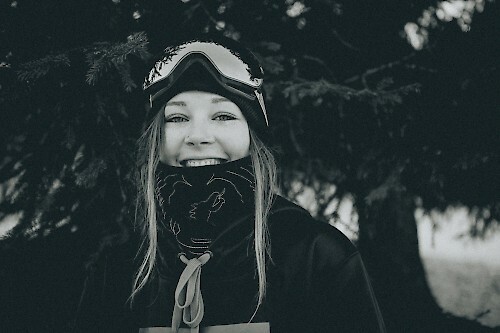 At 13 she started skiing competitively and was eventually on the GB team for Slopestyle Skiing. After an ACL reconstruction over 4 years ago, Sissy is back skiing competitively again, and feeling stronger than ever. She now holds a FIS B Licence allowing her to compete in World Cup Qualifiers and Europa Cups, and has a full schedule of competitions for the coming winter. She is currently professionally sponsored by Coalition Snow, Dragon Alliance Europe and now Mountain Mavericks. Coalition Snow is a women’s specific ski and snowboard company based in Tahoe, USA, that provide her with both park/piste skis and touring/powder skis, whilst Dragon provides her with eyewear and softgoods. Previous: Meet Chalet Le Prele Winter 2016/17 Staff!